very business needs a flexible assistant to optimize the office work cycle especially when it comes to big amounts of paperwork on a daily basis. This video review presents the extremely functional Lexmark X746DE. It can do pretty much everything – color printing, scanning and copying – all essential business tasks. Its multifunctionality turns this machine into an irreplaceable and reliable office helper. This powerful all-in-one laser printer is made to handle a high volume of work. Thanks to the high-speed processor @ 1.2GHz and the 512MB of RAM it pints and copies at speeds of up to 35 pages per minute. The first page comes out in 9 seconds both in black and white and color too. The fast speed delivers vibrant colors too thanks to the Lexmark Color Replacement and PANTONE calibration. 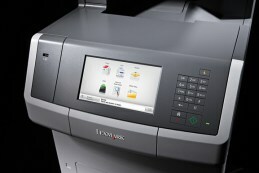 The machine also supports color faxing and color network scanning. The print technology used here is a color laser one. The resolution both in black and color is 1200×1200 dpi or 4800 color quality. This impressive multifunctional office assistant as you see has an impressive weight too – 97lb. The print noise level of this device is 59dBA. The machine features an energy star certificate as the typical electricity consumption reaches 4.52 kilowatt-hours per week. Diverse media formats are supported, including card stock, vinyl labels, banners and many more. The scanner type is of flatbed type with ADF. The maximum monthly duty cycle reaches 100 000 pager per month but the recommended monthly load is up to 10 000 pages. Laxmark cartridges support up to 12 000 pages per cartridge in black and 7000 pages in color. The multifunctionality of the Lexmark X746DE will increase your productivity and deliver high-quality color documents with a single touch. The work process control is a piece of cake as you there is 7-inch color touch screen for a tablet-like navigation of the multiple functions. It provides intuitive and immediate feedback. Thanks to the additional drawers available for the users the total load of this machine can be boosted to the input capacity of 4300 sheets. And don’t worry your data will be safe and sound on this machine thanks to the innovative security controls like authentication and authorization, along with disk wiping and encryption. The Gigabit Ethernet networking means fast data transfer and fast processing.